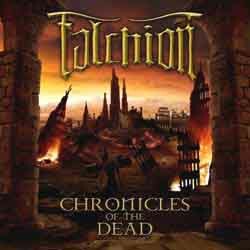 “Chronicles of the Dead” is Falchion’s second album. The Finnish band, that has two members of the folk metal band Korpiklaani, had released their debut “Legacy of Heathens” in 2005 and now, 3 years later, they continue what they begun. They signed to Massacre Records and this time they hope they’ll get the distribution they deserve. Their music is epic death metal, and it sounds somehow like a mixture of Ensiferum and early Children of Bodom. So there is epic riffing and many guitar solos, with a very powerful sound. All of the songs are at mid or fast tempo and the vocals are the classic epic black/death screams (there are no clean vocals of choirs in this one). Everything is very well played, something necessary, since the compositions and the melodies are totally based on the guitars. Unlike most bands of the genre there are no synths in this album, but the sound is still very solid. This album is very good in general terms, but (for my personal taste) I’d prefer a bigger variety in the vocals and the intensity of the songs, since they are too bombastic most of the time. Of course all of the compositions have a lot of work with many different ideas in the guitars, all under a “polished” production that is necessary to “capture” their sound. So if you like this kind of epic melodic technical black/death metal you should check Falchion. You can get a taste of their music at their myspace profile.